Small hatchbacks such as the Mazda 3 and Ford Focus are not selling quite as well as they used to, with the boom in small crossovers such as the Mazda CX-3 and Honda HR-V eating heartily into their market share. The Japanese Mazda 3 is one of them, a perennial favourite among private buyers and runner-up in the sales race to the Toyota Corolla. Also a bit of a critical darling, long seen by many as second-in-class to the outstanding Volkswagen Golf. 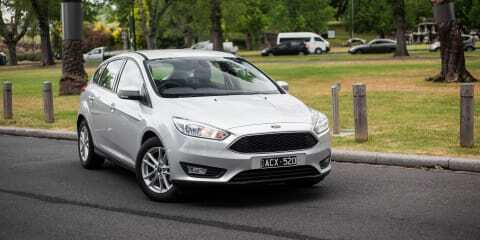 It’s a welcome update, because Ford Australia’s Focus sales are something of an anomaly. The car is a bona-fide megastar globally — it’s the world’s top-selling nameplate — but last year in Australia the mighty Mazda outsold it six-to-one. Of course, it’s not all about volume. But it says volumes about the strength of the Japanese brand here. Because the Focus has always been an excellent option, with only a few quibbles holding it back. These quibbles, we’d add, are precisely what Ford has corrected for the update. There’s a far more resolved interior design that brings its infotainment into the 21st century, and a new downsized turbo engine from its acclaimed EcoBoost family. There’s also a rather fetching new frontal design with an aggressive, sporty grille that gives even the base car excellent road presence. Reflecting Ford’s determined move upmarket — promoting fancier dealers and a prioritisation on private rather than fleet buyers attest to that — means the company has also trimmed back the scope of the Focus range. As such, there’s no circa-$20,000 entry car to get buyers into the door. In return for a higher price of entry, all variants get a very powerful engine for the class, and come loaded with equipment. In fact, as you’re about to read, the base Focus costs exactly the same as a second-from-base Mazda 3. This comparison test basically writes itself. The Focus Trend entry car you see here instead comes in at $23,490 plus on-road costs, or $24,490 with the automatic transmission that everybody will buy. Kudos to Ford for charging just $1000 extra for the self-shifter, which is half of what rivals will sting you. Conveniently, this $24,490 entry price is exactly the same as an automatic Mazda 3 Maxx, which sits one rung up within the range above the Mazda 3 Neo. Neither of these cars is left wanting for standard equipment. Each packs the sort of features list that was the province of upmarket variants even half-a-decade ago, and each can rightfully lay claim to being a value leader. In fact, you’d have to suggest that Ford’s product planners here looked very closely at the Mazda to see how it’s done before launching the revised Focus. They’re all but identical. Common equipment to both includes: Bluetooth streaming, two USB inputs; satellite-navigation on touchscreens; a voice control system; cloth seats; regular (not climate-control) air-conditioning; 16-inch alloy wheels; one-touch indicators; a reverse-view camera and rear parking sensors. Both offer five-star ANCAP safety ratings and sport six airbags. The safety conscious can option a pack that brings blind-spot monitoring, rear cross-traffic alert, low-speed autonomous brakes to the Mazda 3 for $1500. That’s commendable, Mazda. Differences are minor. The Mazda alone offers push-button start and ISOFIX seat anchors, while the Ford alone offers one-touch functionality on all four windows and a full-size spare wheel. Ford charges $450 for metallic paint, whereas Mazda gives it gratis, with thee exception of the gorgeous $200 Soul Red. It’s really too close to call. Perhaps the Mazda by a whisker. The Ford’s cabin is a huge step up on the pre-facelift version, but is it better than the Mazda’s? It should be, considering the latter is a couple of years into its life cycle. The overall design of the Ford is infinitely less cluttered than before, with a fascia dominated by an 8.0-inch touchscreen, integrated nicely into the layout and sitting atop a neat series of audio and air-conditioning controls. The Mazda’s layout is no less pleasing to the eye, but there are more blank areas and dark colours, and the screen feels a little more tacked-on. In terms of materials, though, the Mazda is the winner. The wheel, gear lever and handbrake are leather (the Ford’s are urethane), and the ambience is improved by higher-grade plastics on contact points, and glossy black, silver and faux carbonfibre highlights scattered about to lift the feeling of quality. The Ford’s plastics, and general trim, are certainly better than before and entirely decent for the class, but the Mazda feels that bit more expensive. There are certain plastic surfaces in the Focus where the pennies have been pinched — not so with the Mazda. That said, the Ford’s modern instruments with digital speedo beats the Mazda’s classy silver and red analogue dials for function, if not form. And the Focus’ doors also close with a more pleasing thud. Neither can be faulted for their driving positions, with cloth seats offering marginal support and adjustability — both are a little short in the base — and rake/reach-adjustable steering columns. The Mazda’s wheel is nicer in the hand on account of its leather wrapping, but each contender has equally intuitive audio/phone/cruise control buttons. Ford’s SYNC 2 infotainment system works off a home screen divided into quadrants, with each tab holding menus to navigation, audio, climate and car information. It works a treat, and the conversational voice control system ditto. Whether it beats Mazda’s MZD Connect system is a point of opinion. The Mazda offers a small screen (seven inches) perched atop the dash, but can be controlled by both touch and a rotary dial on the transmission tunnel just like BMW’s iDrive. What both systems have in common is decent resolution and graphics, full-colour displays and Bluetooth functionality that re-pairs rapidly every time. Both are eminently liveable, being simple to operate. Both are also paired to great audio systems with clear bass and precious little disruption. I’d go for the Ford, personally, given its bigger screen properly integrated into the dash for me edges the Mazda’s unit, despite the excellent rotary dial that falls easily to hand over jittery surfaces. In terms of storage up front, both models have door pockets (the Ford’s are bigger), handy phone/wallet holders and small consoles and gloveboxes. Each also has two proper cup-holders. In the rear, the Mazda offers a hint more headroom, while legroom is about the same — that is to say, sufficient to allow to 180cm-plus adults to sit behind two same-sized people up front. Neither is the last word in shoulder room, but the Ford has a third window on each side that makes it feel less claustrophobic and easier to see out of. Dimensionally, the Ford is narrowly the bigger car (78mm longer, 28mm wider and 37mm taller), but the Mazda’s wheelbase is longer by 52mm, liberating cabin space. Hence our findings. The Ford offers superior storage solutions in the doors and seat, and two map pockets (the Mazda has one). But the Mazda counters easily with a flip-down ski port with cup-holders, outboard ISOFIX anchors (oddly enough, not in the Ford) and overhead grab handles as opposed to the Ford’s cheapo hooks. Both cars have rear seats that flip-fold 60:40, and the storage with them occupied is almost identical — 316L for the Ford and 308L for the Mazda. Neither of these are class-leaders in this department, then. Crucially the Ford has a (limited to 120km/h) full-sized steel spare that beats out the Mazda’s space-saver. Again, it’s a close call. This is one hell of a close-run thing. It’s also worth keeping in mind that both of these cars can be had in sedan bodies at the same price. At last, we have a point of difference. In the blue corner, the revised Focus sports just one engine option (if you exclude the hard-core 184kW ST). This is a 1.5-litre turbo-petrol four-cylinder from its EcoBoost family producing some very impressive figures for the class. The 132kW of power (at 6000rpm) and 240Nm of torque (between 1600 and 5000rpm) claimed by Ford are the sort of numbers that would have had the Focus classified a warm-hot hatch just a few years ago. This engine is matched to a choice of six-speed manual or six-speed automatic transmissions. Here we go for the latter — at $1000, it’s way cheaper than similar setups in rivals — that almost everybody will opt for. Unlike the old Focus, this is not a Powershift dual-clutch unit (think of that old ‘box as Ford’s attempt at Volkswagen’s DSG) but instead a traditional unit with a torque converter. The Mazda 3 sports the company’s modular SkyActiv architecture shared across its range. The Maxx variant gets the smallest engine in the Mazda 3 range — a high-compression 2.0-litre normally aspirated petrol with 114kW at 6000rpm and 200Nm at 4000rpm. Matched is a six-speed auto with paddles. Like the Ford, it also has a subtle Sports mode than holds lower ratios longer. 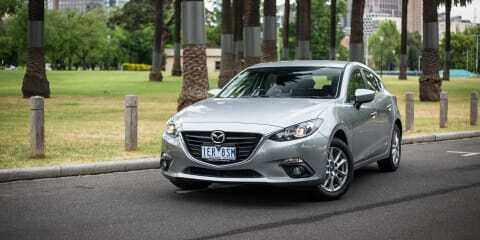 Now, you may be wondering, why didn’t we test the Mazda 3 SP25 with its larger 2.5-litre engine with 138kW and 250Nm? Surely that’s a better match to the Focus? It is, but with an auto it also costs $27,190, and therefore is that little bit more expensive. If anything, this fact shows once again that Ford has actually pulled together an excellent value proposition on the base Focus. Now, given the Ford employs a downsized turbo engine, you’d suspect it may be more frugal on fuel than the Mazda. You’d be wrong. Mazda’s ADR claim of 5.8 litres per 100km beats the Ford’s 6.2L/100km, though both are to be commended for being able to run on cheaper 91RON petrol. Across our test cycle, the Mazda regularly returned between 0.5L/100km and 1.0L/100km better economy than the Ford, putting the truth to these respective claims. Though even in hard driving with lots of full-throttle, neither registered usage in excess of 9.0L/100km. It’s also worth factoring in that despite the power/torque gulf, the Mazda’s 1265kg tare mass is 101kg lighter than the Ford’s. In the Focus, you’re effectively lugging around a big bloke all the time, compared to the lithe Mazda. The Ford still has 7kW/tonne more than the Mazda, though. As such it isn’t enough to stop the Ford feeling faster, with its 8.5 second 0-100km/h time about half-a-tenth faster than the Mazda. Neither car is lacking punch, as you can see. Around town, the Mazda’s natural aspiration makes its torque delivery to the front wheels that little more instantaneous and the power curve slightly more linear, but the Ford’s little turbo has precious little lag and the six-speed ‘box none of the low-speed hesitation the old Powershift did. The Focus’ engine is an absolute cracker, with a lovely little raspy exhaust note, good rolling response and a strong mid-range, plus a willingness to rev out if you want to have some fun. There’s potentially no non-dedicated performance hatch variant with a better engine. The gearbox is a solid match, with a welcome docility around town and the ability to be decisive in its downshifts when you find that twisty road. The manual mode is still controlled by monumentally stupid buttons on the shifter rather than paddles, however. Despite its more average outputs, the Mazda’s engine remains pretty strong. It has no trouble pulling the little 3 off the line, and as we said, it’ll get the jump on the quicker and more characterful Ford before being reeled in. Much of this is the calibration of the six-speed auto, which is a masterclass. Good paddles too. On balance, the win here goes to the Ford, but not by the degree it my appear on paper. The Golf notwithstanding, you’d be hard-pressed to find two mainstream small hatches with better ride/handling and steering packages than this pair. For one, both are in that sweet spot where they don’t have big wheels and firmer suspension to throw the sport/comfort balance out the window. There are some commonalities. Both have all-round independent suspension, both have electric-assisted steering with about 2.6 turns lock-to-lock, and both have 16-inch alloy wheels on 205/60 profile tyres (Michelin Primacy rubber on the Ford, Bridgestone Turanzas on the Mazda). When it comes to outright fun factor, it’s the Ford by a nose. It’s steering is lighter than the Mazda’s by a small margin, but in typical Euro-tuned Ford fashion, is also wonderfully direct and sharp from centre in a way that renders its lack of feel-and-feedback unimportant. Combine this with a brilliantly balanced chassis that make the car nimble and highly controllable, and you have a recipe for proper fun. Trust us, point this thing at a winding ribbon of tarmac and have a crack within your abilities whenever you can. The Mazda is no slouch here either, and lives up to the company’s ‘Zoom Zoom’ mantra with aplomb. Its steering offers a little more welcome resistance than the Ford and is less… you might say twitchy. It feels moderately more planted and mature, whereas the Ford sits on the balls of its proverbial feet. Which is precisely why I like the Focus so much. Both also offer comfortable ride setups over unforgiving roads. Neither ever floats or wallows, nor feels over-damped or jittery. Both also offer excellent all-round braking performances with ample stopping power, though the Ford’s pedal is a little sensitive. The Mazda comes across as being that little bit more softly suspended/damped given it rounds off harsher bumps slightly more effectively and rebounds from speed humps with a little more cushioning than the Ford. But both are exceedingly well-balanced. Both also feel planted at highway speeds, though neither is a paragon of high-speed noise suppression — each recorded noise readings of 78Db over the same stretch of highway, a combination of moderate tyre noise and wind noise through the A-pillars. Again, it’s the Ford by a nose. Both cars come with a three-year warranty, though the Ford’s ends at 100,000km whereas the Mazda’s has no kilometre limit. Both also get transferrable capped-price servicing for the life of the vehicle, though the Ford’s plan appears better. Each service interval on the Focus is 12-months or 15,000km, whichever comes first, whereas the Mazda’s is 12-months/10,000km, whichever comes first. Each of your first three visits in the Ford will cost you $340 a pop, while the Mazda’s are $295, $323 and $295 again. But consider the Ford’s superior intervals. Ford also throws in free state Auto Club roadside assistance and membership with every standard service, for up to seven years. Mazda’s basic roadside assistance package costs $68.10 per year. Ford will also give you a free loan car, provided they aren’t all booked out, though Mazda counters with its offer of express servicing — coffee while you wait. All told, the Ford’s longer intervals give it the edge, unless you drive lower-than-average kms each year. The first thing we’d make clear here is that both of these entries are outstanding offerings in a highly competitive class. There is a reason why the Mazda 3 is proving to be so enduringly popular. It’s a well-priced, well-equipped and dynamic little offering with a premium edge inside its cabin, backed by Mazda’s strong reputation and friendly public face. A thoroughly good buy, it remains. But the win here goes to the Ford, which offers a slightly more dynamic drive, a punchier engine (tempered by slightly higher, but still highly affordable, fuel use) and a marginally better ownership program. Really, if ever there was a twin-test that came down to the splitting of hairs, it would be this one. Click the Photos tab to see all the images of the Ford Focus Trend and Mazda 3 Maxx, taken by Tom Fraser.